We should think about the ocean because we can’t live without it. It supplies our fresh water and nearly all of our oxygen. It gives us food, medicines, and energy resources. It provides jobs and serves as a highway for global transportation. Humans affect the ocean too, through fishing, pollution, and building. All life on Earth depends on the ocean, so it is up to all of us to care about it. 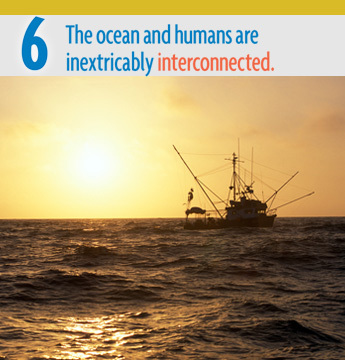 6: The ocean and humans are inextricably interconnected. a. The ocean affects every human life. It supplies freshwater (most rain comes from the ocean) and nearly all Earth’s oxygen. It moderates the Earth’s climate, influences our weather, and affects human health. b. From the ocean we get foods, medicines, and mineral and energy resources. In addition, it provides jobs, supports our nation’s economy, serves as a highway for transportation of goods and people, and plays a role in national security. c. The ocean is a source of inspiration, recreation, rejuvenation and discovery. It is also an important element in the heritage of many cultures. d. Much of the world’s population lives in coastal areas. e. Humans affect the ocean in a variety of ways. Laws, regulations and resource management affect what is taken out and put into the ocean. Human development and activity leads to pollution (such as point source, non-point source, and noise pollution) and physical modifications (such as changes to beaches, shores and rivers). In addition, humans have removed most of the large vertebrates from the ocean. f. Coastal regions are susceptible to natural hazards (such as tsunamis, hurricanes, cyclones, sea level change, and storm surges). Summit: The 2014 NEOSEC Ocean Literacy Summit focused on this principle.